Arborek Village is located in the Raja Ampat area of West Papua, Indonesia. The village is a discovery in more ways than one. Why were we in Arborek Village? 1 Why were we in Arborek Village? We arrived on a hot as hell day, and that is putting it mildly. Little children lined the pier, as did the adults of the village. 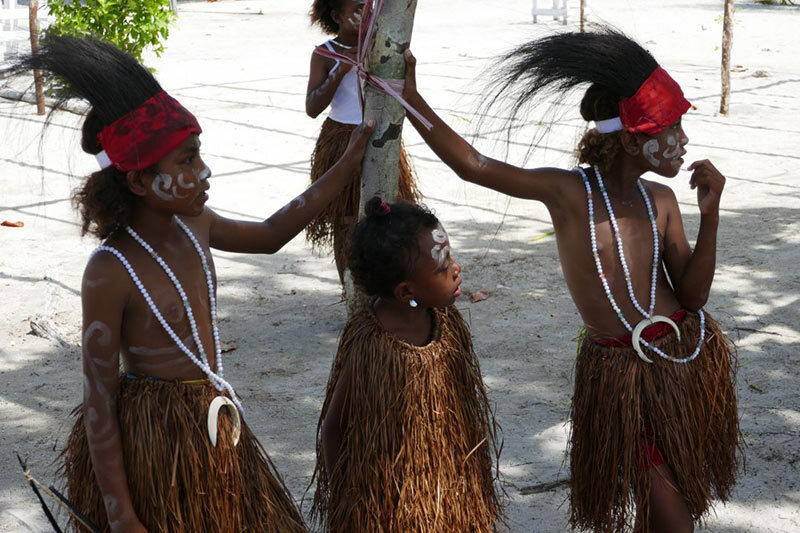 They were in traditional Papuan costume to greet us. I will be the first to admit that this felt a little uncomfortable. One, it was stinking hot, and the children had on very hot outfits and were caked with the traditional paint, and two, we were not a cruise ship arriving at the island to receive such a greeting. 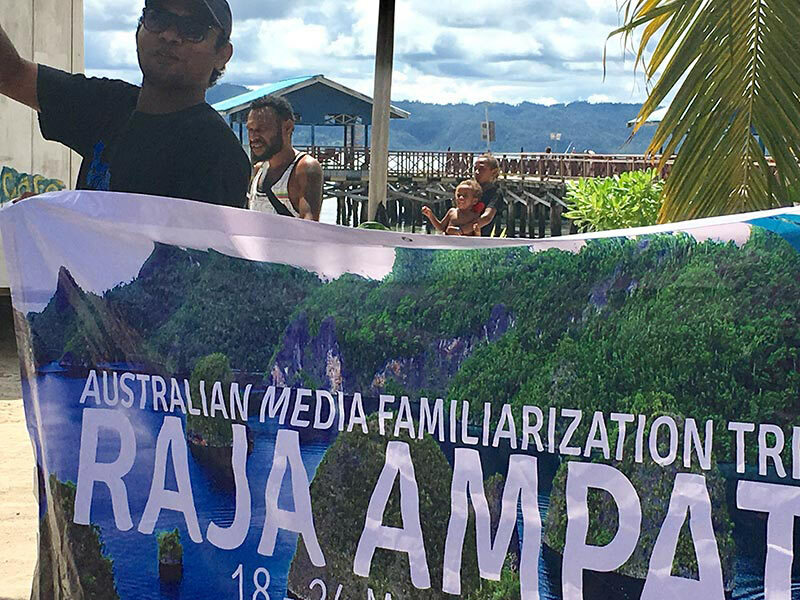 We were a motley crew of hot and tired media people here to see what Raja Ampat had to offer. To date on our tour of this vast archipelago of islands, we were gobsmacked by the beauty of this very pristine and remote marine park, so that this welcome seemed a little incongruous. But therein lies the appeal and the cleverness of Arborek ‘Tourism’ Village. Arborek Village is fast gaining an outstanding reputation among both the local authority and international community for developing local regulations for community-based marine conservation. They want the world to experience the beauty that they live with daily, but they want it on their own terms. It is the local people who are running the show here in Raja Ampat, and in Arborek Village, in an attempt to keep it in its immaculate state, and to make a living from their own backyards by offering homestays to the visitors who trek to this quite remote location. The village and many of the other villages that are spread far and wide throughout this Indonesia archipelago, wish to preserve the marine park so that it does not go along the same lines as our own Great Barrier Reef in Australia. The Great Barrier Reef is under threat from some sources like climate change, poor water quality from land-based run-off, the impacts from coastal development, illegal fishing, and also the vast numbers of tourists who frequent this world phenomena. The people of Arborek Village do not want this to happen to them, yet they do want people to visit Raja Ampat. With the support of the national and local government, research centers, and non-government organizations, the people of Arborek have succeeded in formulating local regulations to keep a degree of control over their livelihoods, and their destiny. So if that required singing and dancing for us in searing heat to bring the tourists that they need, but need to manage, then we were not going to let this go unappreciated. Arborek Village has about 197 residents. It is first and foremost a fishing village, and then a protector of the Raja Ampat environment. Ironically as we were talking with one of the villagers he was telling us his brother had gone to Australia to study, and that he was hoping to make it here next year to study music. What you need to appreciate is that Arborek Village is a long way away from anywhere. It required us to fly from Jakarta to Makassar, from Makassar to Sorong, and then hour and hours of being in a boat to get there. This is not a convenient place to visit, and nor is it a convenient place to get an education and admittance to a prestigious university in Australia. Therein lies the amazement that travel brings to me. People with very little, and in far flung places prove that they can achieve anything. Here is an even better story that transpired from our visit to Arborek Village. One of the journalists in the group, Ian Mclean, is a music and theater writer. 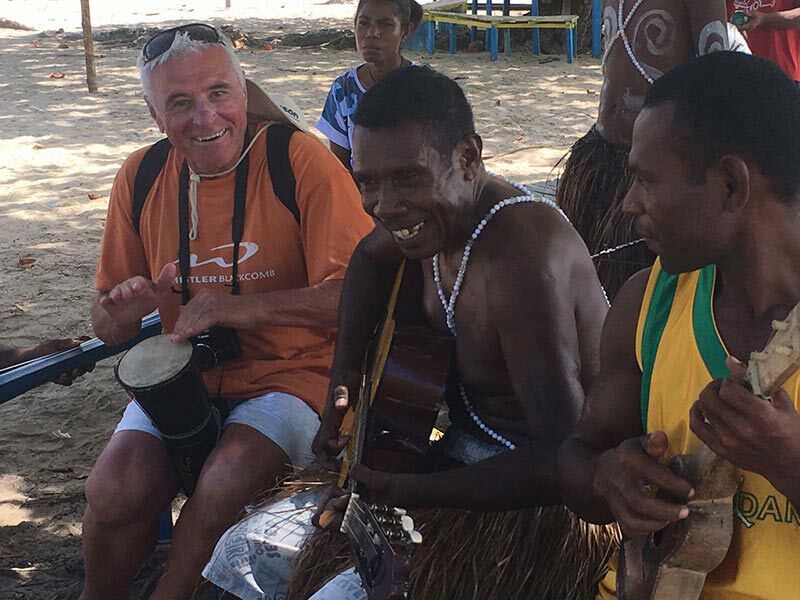 As soon as Gordon had spoken to one of the local men about his intentions to study music in Australia, Gordon introduced him to Ian, who had the connections to make his studies in Australia, a lot easier. To celebrate this, guess what happened? There was a communal music and dancing sessions, involving the villagers and we members of the Media Fam Trip. I digressed, but in the best possible way. After welcoming us to their island home, we followed the local people through the village to where an umu was being prepared for us. It was a little odd for us, I will admit. There was a big banner saying who we were, and it made it seem like we were important people. I guess to a degree we were. We are now able to tell you about this very talented village who cares about their bountiful environment and have every intention of preserving it … THERE WAY. We watched as the ladies uncovered the fish and vegetables from the underground oven. There was most definitely a seniority involved in who did what. A very old woman was summoned from a house to do the final peeling off of the banana leaves to reveal the feast. And yes, the aromas flooded the island. The local children were as excited as we were to with this feast and we were delighted that they were a part of it, sort of. They stood away from us as we ate, but they were never too far away. If you want to go hunting for sea-cucumbers, ask the women of the village. Just say ‘Bameti,’ and they know what you would like to experience. Arborek Tourism Village, are also known for their handicrafts using pandan leaves. It is the women making different hats, and noken (string bags) are collector’s items that the few visitors are coveting. They are proud of their skills with good reason. 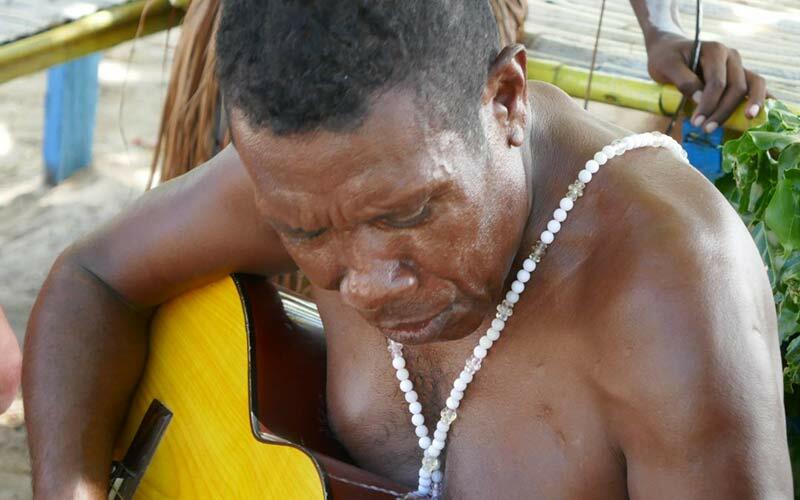 Music is part and parcel of the villagers of Arborek’s lives. In fact, it is integral to the lives of all Indonesians, and I know that music is such a globally common thread. The villagers cannot help but sing and dance whenever and wherever, and I for one have no issue with this. 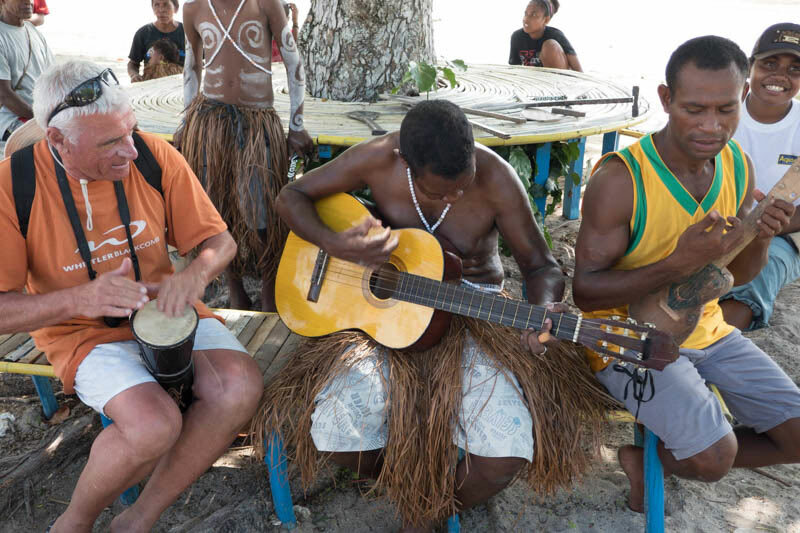 People come to Arborek Village to do homestays while they dive and snorkel the pristine reefs and waters. What can I say? 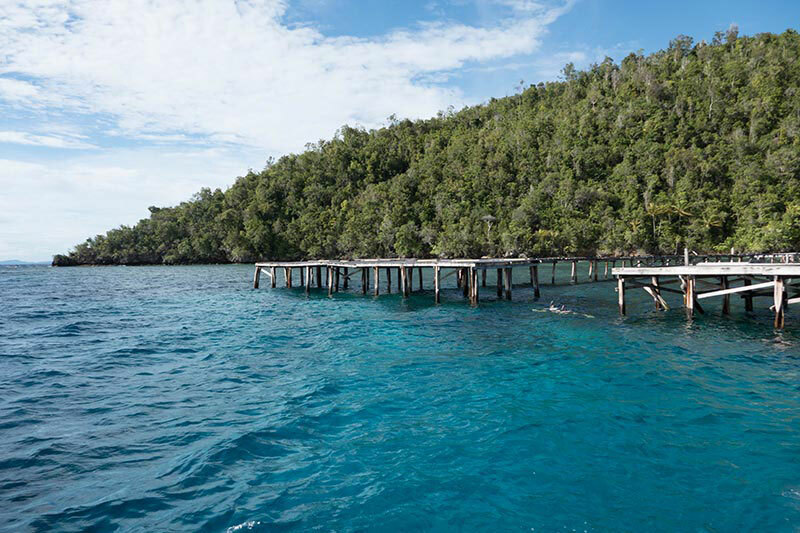 Diving is, at this stage, the main reason why visitors come to Raja Ampat. I don”t dive but I do snorkel, and I do enjoy exploring and discovering things that are outside of my comfort zone. Read anything we have written about Raja Ampat and who would not be convinced by the splendors below the surface of the clear as clear water. 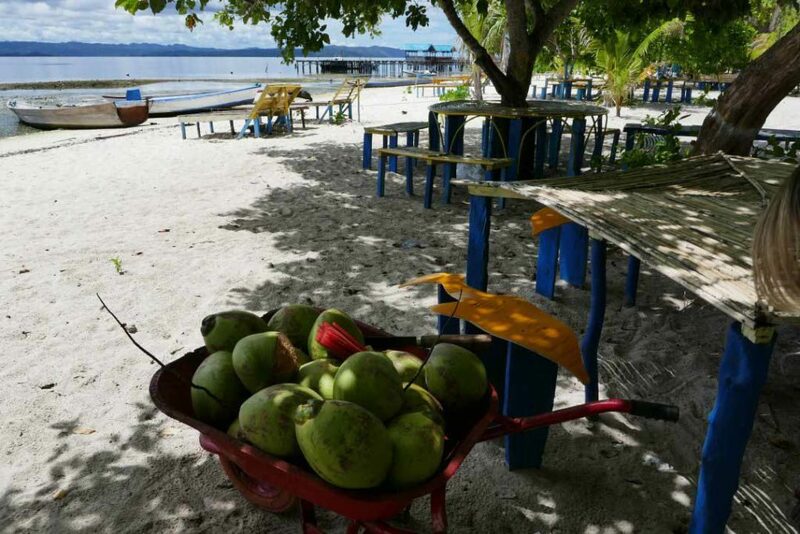 Arborek Village is about 2 hours from half hours from Waisai, the capital city of Raja Ampat. Waisai is 2 hours from Sorong. Sorong is a one hour flight from Makassar, and Makassar is a one hour flight from Jakarta. Yes, it ‘s hard to get to the village and indeed all around Raja Ampat, but it will be the most worthwhile thing you do…before everyone else discovers it. A mysterious place but charming as well and the traditional cooking really marked on me, I never thought that there is another way of cooking like this one. Looks so difficult but I think it’s all worth it. I have experienced similar cooking in Samoa, and I loved the naturalness of it. Sounds like a real adventure where you can experience a culture that has not been tainted by the outside. sounds like camping a bit but very genuine.